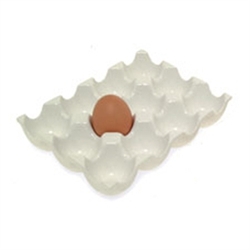 Today's giveaway is the Ceramic Egg Rack (holds 12 eggs). So cute! We are expecting our first chick-babies in June :) Can't wait! I think this ceramic egg rack would be absolutely perfect to showcase our children's Easter Eggs in the spring and our Easter Eggers' eggs the rest of the year! I just love this egg rack, it's simple, it's farmy, and it's absolutely adorable!! Who wouldn't want to win?? Plus who wouldn't want one more place to showcase their the awesomeness their chickens create! The rack would be great for Easter...I am hatching chicks ut now. I love chickens! Our latest batch of chicks started laying this spring, so an egg rack would be a good thing to have! Thanks for these contest for all us chicken lovers! Really neat! I can see it in my fridge already. Oh my goodness we NEED one of these. I diligently collect paper egg boxes to use and my children steal them and cut them up to make armies of chicks! All different breeds! My house is absolutely full of egg box chickens while they wait impatiently for our chicks to hatch. In the meantime I'm stuffing eggs to eat in all sorts of bowls lined with cloths! I'm so pleased to have found this site and can't wait to check it out! Thanks to Jenna Woginrich for pointing me in your direction. I LOVE her books and her blog! This is so much sexier than the plastic rack in my fridge. Oh, I LOVE these! So smart! I'm building my coop next week and will definitely need something like this to store the bounty in! This would be great to keep my duck eggs in so they aren't in the cartons with my chicken eggs. Very cute! I will be getting my chickens in July, can't wait for eggs! I would love this lovely egg rack! I dont have a deviled egg plate. I use a regular plate but the eggs slide around and it doesnt look very nice. I think this would be perfect to take them on.